After five years as a dedicated Nikon shooter, a new little bundle of joy has entered my home and, if some of my British photo friends are to be believed, it will transform my life. I started my serious digital photo madness while visiting Scotland in 2009. A slippery Canon Powershot leapt from my hands in the Piping Museum and crashed unceremoniously to the floor on the first of 10 days in Scotland. A quick trip to John Lewis and I had my first DSLR, a Nikon D60. Having shot film with a Canon FT in my youth, I was no stranger to a "real" camera but DSLR's were not yet the rage and Nikon's entry-level camera felt good in my hands so I bought it. It was a wonderful but short-lived affair. The D60 was the silver door which opened my eyes to what could be. I was quickly outgrowing that little camera as I found the next door, the D90. This upgrade happened just about a year later. The D90 was the gold standard of the Nikon line. It was a fabulous camera. Coupled with a Nikkor 18-200mm lens, it was truly all the camera I could ever want or use. I carried it, quite literally, everywhere. If I left the house, I had it in my bag. It went to restaurants, work, the grocery store. I was never more than a few feet from it and couldn't imagine not having it at my side. That is, until I discovered the rich beauty and depth of full frame imagery. The gold door no longer held any magic for me once I was aware of the platinum door. One more upgrade, this time to a Nikon D700, brought me into the league of the big boys (and girls... sorry Toni). It was 2012 and I was in full frame heaven. I had a lot of peer pressure to move up as most of my photo friends had already done so. I was in an elite club. I was proud to whip out the beast, resplendent in its fat-glassed, high-dollar glory. Sure, each lens cost more than at least three of the cars I've owned in my lifetime but hey, the image quality was worth it. I was doing a lot of model shoots at the time and that lovely piece of kit was earning its keep as an art-making machine. Over time, I found myself carrying the D90 more and more when out chasing sunsets or on holiday. The resin body was lighter, and it was just more comfortable to carry. I had regressed. The D700 sat on the shelf and the D90 went everywhere with me, just like old times until it was stolen from me by gypsies (seriously) while on a long weekend in St. Petersburg, Russia last summer. It was insured as was the high-end lens I lost with it but the damage was done. When I lost that D90, I lost a bit of innocence along with it. I didn't like carrying the D700 because of its weight anyway and now I was painfully aware that it could be easily wrested from me and that further kept me from wanting to leave the house (or studio) with it in tow. So, for months now, I've been content shooting iPhone photos when I'm out and about. The quality was lacking but the memories were not. I hate point and shoots for a dozen good reasons but I've been cautiously watching the new mirrorless cameras which have been taking more and more market share from both point and shoots and DSLRs. I considered a Nikon 1 but the reviews were less than stellar and the former gold standard of this size camera, the Canon G11 (now the G16), didn't really seem up to my needs and experience so I continued to search. Recently, some of my UK-based photo friends have begun migrating to the 4/3 sensor Fujifilm cameras. As I respect these shooters, I began asking questions. They gave glorious, over-the-moon reviews. 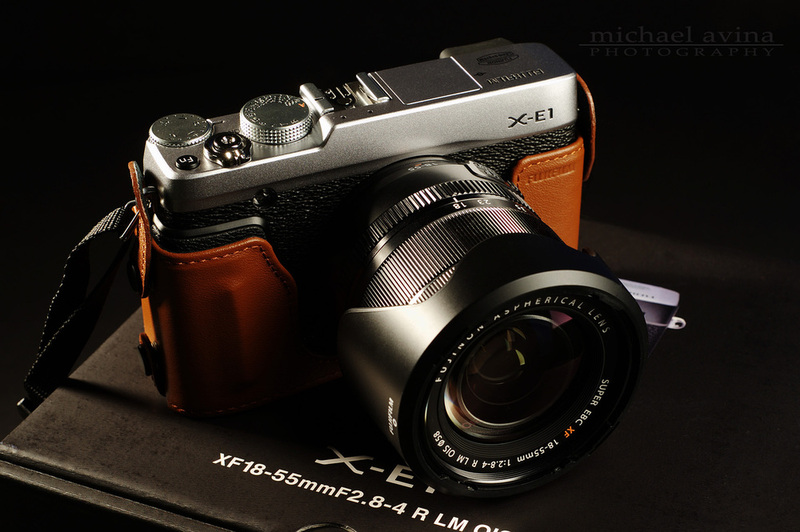 I first looked at the Fujifilm x100s. Retro-styled and all business, it was an awesome little rangefinder but the fixed lens eventually closed that door for me. I wanted a small amount of zoom and more versatility which brought me to the XE-1.